Ancient Sparta – a perfect gerontocracy? Posted 5th February 2017 & filed under Ageing, Blog, Intergenerational Justice. The first thing that probably comes into most peoples’ heads when they hear the name Sparta is the 2006 historical action movie 300 that depicted the famous last stand made by an army of just 300 Spartan soldiers against thousands of Persians at the Battle of Thermopylae in 480BC. The source material for that film was actually a comic book series about the battle by Frank Miller and Lyn Varley, and in a sense its box office success was disappointing as it appears to have crystallised the contemporary public’s view of the Spartans as a race of muscle-bound, near super-human warriors, a view which distracts attention away from the far more interesting reality of the unique social and political system the ancient Spartans invented. It is also significant in intergenerational terms, as it has been argued that ancient Sparta was the most perfectly-realised system of gerontocracy – a system premised on the rule of the old – which any human society has ever implemented. These days, the term gerontocracy is often used figuratively to describe the outsized influence that older people appear to enjoy in many advanced democracies because they are more numerous than younger generations and they have a higher propensity to vote for established parties. Indeed, IF has conducted several analyses of voting patterns in the UK which have demonstrated the extent to which the influence of older voters could be said to be over-represented. Of course, there is also a tendency within democracies for political representatives to be older than the population average, as is notably demonstrated by the House of Lords, where the median age was 69 in 2012. However, there is an important difference between genuinely democratic systems in which older people tend to exert more influence than younger ones, and genuine gerontocracies in which people are formally granted power on the basis of their age. Partial gerontocracies have arguably existed in the politburos of both communist Russia and China, but no system appears to have formalised the principle of gerontocracy to the same extent as ancient Sparta. Sparta was one of the ancient Greek city states that existed in modern-day Greece between roughly 800BC and its defeat by Thebes in 371BC, where it occupied the area called Laconia in the south-eastern Peloponnese. The various ancient Greek city states embraced a variety of different modes of governance, but whereas Sparta’s great rival Athens remains widely-known to this day for the creation of Athenian democracy, Sparta (like several of the other Greek states) was an oligarchy in which power rested with a small number of people. Spartan society was extremely unequal. Early on in their history, the Spartans are known to have conquered a neighbouring people whom they called “helots”, who remained a permanent underclass of non-citizens throughout the rest of Sparta’s existence, despite their huge numbers: at its height, Sparta contained just 9,000 Spartan citizens who ruled over at least 100,000 helots. Within the population of “true” Spartan citizens, a small aristocracy is believed to have controlled most of the real power, and it was from their number that Sparta’s main ruling body, the Gerousia (Council of Elders) was drawn. The Gerousia had 30 members, of whom 28 had to be over 60 (the other two members were Sparta’s two kings, each of whom was drawn from one of the two Spartan royal families), who were elected to serve for life by the male Spartan citizens. Between them, the Gerousia and the two kings exercised most of the political power in ancient Sparta as this body both functioned as a supreme court and determined which motions would be put before the popular assembly, the Apella, with the power to block any measures they disagreed with. Each year, five members of the Gerousia were elected by ballot to effectively serve as ministers (or ephors, “overseers”) who would execute a range of functions on its behalf, such as negotiating with foreign governments, implementing legislation passed by the Gerousia and acting as judges. They also played an important role in Sparta’s unique social system. Returning to the earlier point about the film 300, Spartans are primarily remembered today as fearsome warriors. 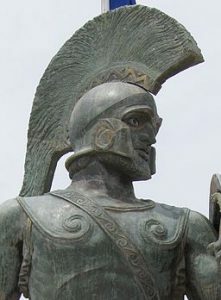 That characterisation is by no means inaccurate: early on in its history, Sparta adopted a unique social system which dedicated all of the activities of state towards waging war as effectively as possible. The system which the Gerousia oversaw was based on eugenics: every child born in Sparta was judged by the ephors for signs of physical imperfection, and those deemed unfit were immediately killed by being thrown from the summit of Mount Taygetus. From the age of seven, both boys and girls were effectively adopted by the state and raised in government-run boot camps to prepare them physically and mentally for their allotted roles within society; both sexes underwent famously gruelling physical training to strengthen them for fighting and child-rearing respectively, and then boys carried on being trained until they were placed in army units at the age of 21 (the male training regime is known to have included hunting and killing innocent helots for sport). Spartan men who managed to survive their years of compulsory military service were allowed to retire at 60, at which point the elders of noble families could join the Gerousia. It appears that the elderly were so highly venerated because reaching old age was the ultimate sign of your courage and prowess in battle; it was commonly said that a noble warrior either came back to Sparta from a military campaign “with his shield or on it”; old men were entitled to double rations of food, according to an episode of Radio 4’s In our Time series about ancient Sparta; the city of Sparta was festooned with engravings instructing younger people to stand and give up public benches (and even latrines) if an older man walked past. The great weakness of Spartan society was that it was intensely xenophobic and reactionary; trade and foreign travel were banned (with the exception of military campaigns) and foreigners were often barred from entering the city state, all supposedly to avoid corrupting the Spartan race through exposure to foreign ideas. Ultimately, such an extremely militaristic society was doomed to fail, and Sparta eventually declined in the early 4th century BC in parallel with the rise of the Macedonian kingdom to its north. However, its experiments with an extreme form of gerontocracy and social militarisation – in which all power rested with a class of retired soldiers – remain an interesting example to this day.